Updated with new deal. 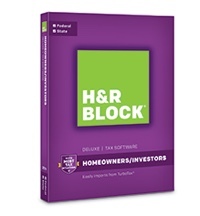 If you are still looking for downloadable desktop tax software that doesn’t require your Social Security Number and financial details to be stored in the cloud, here’s a limited-time deal on H&R Block Tax Software 2016. NewEgg has H&R Block Deluxe Federal + State for $29.99 a free $20 Nike Gift card. If you can actually use that $20 Nike gift card, your net cost would be close to $10. The lowest price ever so far for the same H&R Block software on Amazon was $19 during a flash sale. H&R Block Deluxe includes guidance for stock gains and losses, home mortgage interest deduction, and other itemized deductions. Compare that against TurboTax Deluxe Download which makes you upgrade to TurboTax Premier to get guidance for stock sales and dividends. Keep in mind that for these products 5 Federal e-Files are included but State e-File is extra ($19.95 for all I believe). I would personally just print the (usually shorter) state return out and snail mail it in if you don’t have a free State e-File option.